Lots of feedback rolling in from the recent item on that scary gay longhair website. I discovered this after reading the item on your blog and amusing myself by sifting thru ads placed by the longhair gays. That’s when I found this under the name “Kwai Lam.” It’s obviously Stallman. The clue of course is that “Kwai Lam” is a Klingon phrase meaning “one who obstructs or delays,” as in “one who stalls,” or “stall man.” Well many pages of Slashdot are being given over to this mystery and some members are very angry, not that they dislike homosexuals but just our Dear Leader has kept things from us. Plus, the text of his ad which is terribly frightening. And the URLs for his photography, including pictures of his lover, have upset many people. Check it out if you have a few minutes to waste. But be warned: the photos of his lover get nasty. Definitely not suitable for work. And definitely not for right after you’ve eaten. Wait 20 minutes or something. 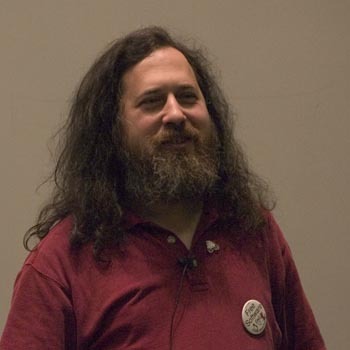 » Stallman ejects from space shuttle?